This is part of the lesson delivered by our tutor in April 2012. In this lesson, the tutor discuss how to determine the electromotive force and internal resistance of a cell by using open circuit/close circuit method. In the diagram above, if the circuit is open (switch off), the reading of the voltmeter shows the EMF of the cells. If the circuit is closed, then the reading of the voltmeter shows the terminal potential of the cells. 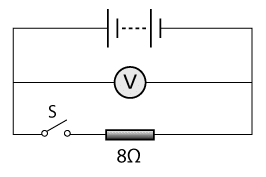 The internal resistance can be found by using the formula E = V + Ir.